The term "Jim Crow" refers to a set of laws passed in many U.S. states, predominantly in the South, that placed severe restrictions on the rights and privileges of African Americans. Laws often consisted of the denial of voting rights, the maintenance of separate schools, and other forms of separation between races. 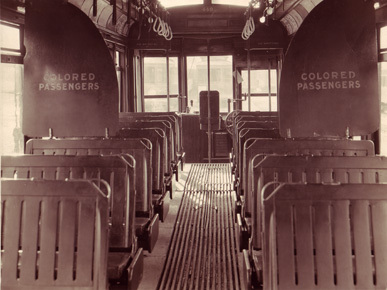 Rail cars for white passengers were usually in better quality than the cars reserved for blacks, the "Jim Crow car," or "smoke car." Back to "1901 Constitutional Convention"
Go to "The Effects on American Society"